Each home has got its own secret recipe for the meat mixture and I can assure you each potato chop tastes unique. It may look a little difficult to make, but if you follow my recipe closely, these will be an instant hit at home! You can serve them on its own as a snack/appetizer, or serve it as a side dish. You’re in for a treat with this one! Step 1: Boil the potatoes with the skin on in a large deep vessel with 3/4 tsp salt. Once the potatoes are well cooked, turn the gas off and set aside. 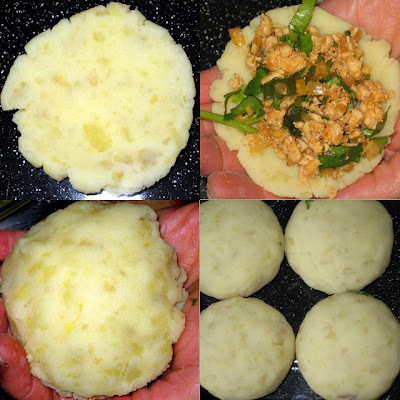 When cooled down, remove the skin and with the help of a potato masher or fork, mash the potato well. Add salt and black pepper powder to the mashed potatoes. 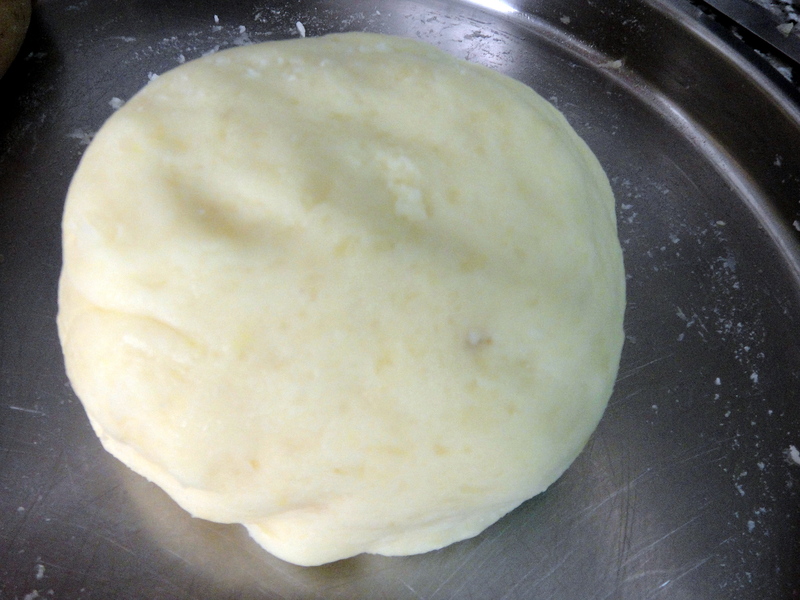 Roll into a dough (as in the picture). Step 2: In a separate shallow vessel, heat about 2 tbsp of oil. Add the onions and chillies and saute till the onions have turned a light brown. Add the ginger-garlic paste, fry for a minute and then add the chopped tomatoes. Step 3: When the tomatoes have softened a bit, add in the turmeric and garam masala powders. Adjust the seasoning with salt. Finally add in the chopped coriander. 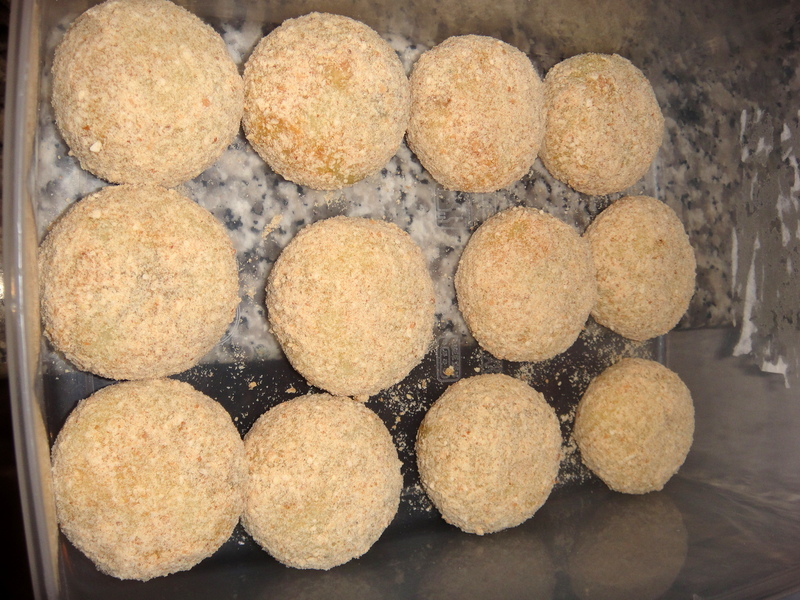 Step 4: For potato chops, the minced meat mix has to be very dry. So on slow fire, keep stirring the mince till you notice it turns dry (you will notice the mince separating from each other), and no water is left. Step 5: The last step is to roll the potato chop. The key trick here is to have a very smooth mashed potato (with no lumps at all) and dry minced meat. You might want to grease the palms of your hand a bit, so you can work easily with the potato. Take a lumb of potato mixture and flatten on your palm, add a heaped spoon of meat mixture in the centre and fold the sides to a ball. Flatten a little and you have the chops. Roll into the breadcrumbs and keep all on tray. Step 6: Take the beaten eggs. Begin by dipping a chop into the beaten eggs and shallow fry in a shallow frying pan, heat just enough oil for frying (we are not deep-fat frying, so do not pour too much oil into the pan). When the oil is hot enough, place the potato chops. When it has browned on one side, turn over and fry the other side till golden brown. Lift from the pan, drain the oil and set on a kitchen towel to remove any excess oil. Serve with any chutneys, Ketchup etc. Tip: if the oil is hot enough, the chop will not catch on too much oil. Usually fried stuff come out oily when the oil is still cold and you’ve already begun to fry the item.